Lerosett has been my "go to" acne brand for over 8 years now! LOVE IT! The organic secret behind Lerosett's magic acne fighting treatments is clay. The Lerosett Acne Clay Treatment is a miracle worker on pimples and clogged pores. I use it as both a spot treatment and a mask, depending on my current needs. The trick to clearer skin is to remove more impurities than you introduce to your skin. This includes not just make-up but, naturally occurring oils, build up of dead skin cells, and environmental factors like dirt and air pollutants. All of these things clog your pores and lead to pimples. The clay in the Lerosett mask removes these impurities leaving you with clearer skin. I swear I can feel nasty dirt and oil being sucked out of my pores while the clay dries. After a ten minute drying time, my skin feels cleaner, tighter and so much healthier. If I feel a pimple coming on, I immediately apply a dab to the cleansed area and let it dry then rinse. If you do this a couple times a day ( I add another dab at night and sleep on it) the almost-pimple is gone in the morning before it ever has the chance to appear! It really is like a miracle! And if you already have a pimple combined with an irresistible need to pick at it…(bad, bad girl/boy) the Lerosett Clay Treatment also helps purge the infected pore of further impurities while sealing the wound to help prevent infection and scarring. The great thing about this product is you can use it on an as needed basis. It helps if you start with a regime of using the mask at least once a day for a few days to really get rid of the layers of oil, dead skin cells and dirt that have accumulated then, you can use it as a mask or a spot treatment when needed. Lerosett also has an amazing face wash the Lerosett Purifying Acne Face Wash. This wash allows you to start your day with amazingly clean skin and it also has moisturizers for any dryness. The phenomenal attribute of these products is they are ALL aloe-based. So, unlike most water-based cleansers and moisturizers, they actually start to relieve and prevent skin irritation BEFORE it occurs. Sometimes it is hard to understand how you can have oily and dry skin at the same time, but it can happen. The surface of your skin can dry out from irritants like soap and other chemicals, you need to use a wash like Lerosett’s Purifying Acne Face Wash to give your skin the proper pH balance then Lerosett Moisturize Matte as your final step to soothe, calm, and moisturize your skin. 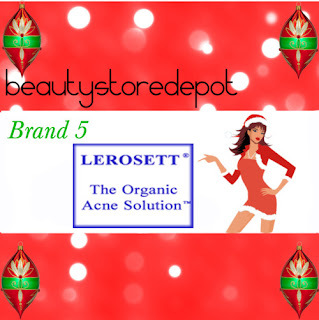 If you have oily and/or acne prone skin, Lersosett IS your answer! Start with one of our two kits and see how well it can work for you. Then check out our whole line of Lerosett products and get more beautiful , healthy skin to show off this holiday season. Lerosett is our first featured brand this week during our 12 Brands of Christmas promo. We will be giving away a Lerosett kit that includes a Lerosett Moisture Matte, Acne Treatment Face Wash, Purifying Toner, and Lerosett Acne Clay Treatment. This kit is valued at $125 and is PERFECT for any of you searching for an acne remedy. Just follow us on Facebook for more indepth Lerosett information, how to win the GRAND prize, games and so much more! BUT WAIT.....it's FREEBIE TIME! I know, we rock! I can't say enough about the Lerosett Acne Clay Treatment and I have LOTS of samples to giveaway...AND I MEAN SEVERAL SAMPLES TO EACH PERSON and I have 10 to giveaway! Wanna win? All you have to do is any or all of the following below to receive entries and then respond with which one(s) you did AND your email address. Good luck! oh and my email is havensmommy26@gmail.com....Thanks for all the great giveaways! It adds excitement to my day! I liked the LEROSETT page on Facebook it said I was #2. Also on Google+ #8. I liked the Acne Clay treatment on FB. #4, as well on Google+, #9. Like #2, #41 and #8! I have sampled the clay mask and that stuff is awesome! I'll have to try it as a spot treatment as well. Question- Can this cleanser be used with the clarisonic or is it abrasive? Will def. review the products as soon as I get them, can't wait! :) Thanks beautystoredepot! You're very welcome! We should have these shipped out later this week. The cleanser should be fine to use with your Clarisonic, but everyone's skin is a tad different, so I would advise starting off only using the Clarisonic once a day until you see exactly how your skin reacts.